Qatar kicked off a new year of culture last night, with the inauguration of Qatar Brazil 2014 at the Museum of Islamic Art (MIA). Dignitaries including Qatar’s Culture Minister and ambassadors from both countries were treated to a performance of Capoeira – a Brazilian martial art which includes elements of dance, music and acrobatics – and music by local band Doha Jazz. Organized by the Qatar Museums Authority (QMA), the 12 months of cultural exchange will feature art and fashion contests, community events and special film screenings and exhibitions. Brazilian food will also feature prominently at this year’s Qatar International Food Festival, whose dates have yet to be announced. This weekend, the cultural exchange commences with the Gulf premiere of Walter Salles’s Central Station (1998) at the MIA. The shows will be held this Thursday and Friday at 7pm, and you can buy tickets here. Screenings of other Brazilian films will be scheduled for the last weekend of each month this year, in partnership with the Doha Film Institute. Next month, the exhibition “Dusk to Dawn… Threads of Infinity” by Brazilian artists Pedro Varela and Carolina Ponte, will open on the Pearl. The display runs from Feb. until May 9. Also beginning in February is an exhibition of Brazilian artist Caio Vilela’s photographs of street football in Brazil, which opens on Feb. 15 at Katara. Fittingly for two countries gearing up to hold the FIFA World Cup, another one of the year’s highlights will be “We Speak Football,” a touring exhibition developed by the Qatar Olympic and Sport Museum and the UK’s National Football Museum. Billed as “an immersive, audio-visual rich and interactive experience celebrating players, coaches, and fans” it will debut in Brazil in May, shortly before the country hosts the 2014 World Cup. The exhibition will then embark on a world tour that will culminate in a final show in Doha in time for the 2022 World Cup. During this competition, the two student groups will vie for the opportunity to travel to the other university as part of a cultural exchange. 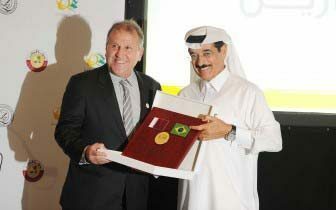 Qatar Brazil 2014 is the country’s third such annual event, following Qatar Japan 2012 and Qatar UK 2013. Last year’s exchange featured over 90 events, including the Damien Hirst exhibition at Al Riwaq, and visits by the BBC Symphony Orchestra and the Shakespeare’s Globe theater company. Are you planning to partake in the events? Thoughts?